We all hate those emergency phone calls, you know, the ones where you know the second you've picked it up, your life is about to change on a dime. I'm grateful that's only happened a handful of times for me, one was one month and a day ago today. That's the day my mother called to say she was bringing my dad in to the Emergency Room*. Though he had no telltale chest pains or aches in his right arm, he knew he was in trouble, and he acquiesced to being brought in. In truth, that's how Mom knew it was bad, that he agreed to being brought in at all. It's been interesting, learning how each family member deals with the stress of the last month. Trying to control the things we can, organizing and cleaning like no one's business, joking to lighten the mood, yelling when we can't. 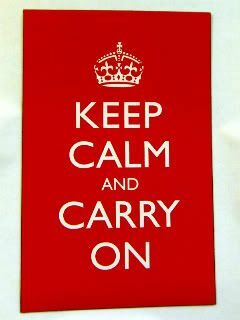 We're still trying to figure out the next steps of treatment, and all in all, we've managed to keep calm and carry on. Today, some will get a little help from some magic pills to help them remain calm during an MRI, and some will be actively trying to find out where the lost family fortune is from those under the influence. I won't say who will win that one. Wish us luck! *Yes. I know that nowadays people call it the Emergency Department, but I honestly can't bring myself to call it ED. Honestly, would ER have lasted as long as ED? Scratch that, maybe it would have lasted longer (see what I did there? ), and the ad sales folks would have found some way to get Cialis or Viagra to be the show's anchor sponsor. I'll be thinking about you all today and keeping my fingers crossed. The magic pills help so much, take it from me. Sending prayers and positive thoughts to you and your family. Hang in there! Thanks both of you for the support. He finally got through it, and even though it probably cost him his cell phone (he somehow had it with him or got it too close to the MRI machine), it was worth the procedure, I guess.